Be the first to share your favorite memory, photo or story of Sophie . This memorial page is dedicated for family, friends and future generations to celebrate the life of their loved one. 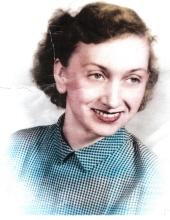 Westminster- Sophie Olivia Vinson Rholetter, 88, passed away, March 23, 2019, at Lila Doyle Nursing Care. A native of Oconee County, she was the daughter of the late Joel Idell Vinson and Sallie Woodall Blackwell Vinson. Sophie worked in the textile industry and was loved by many. Survivors include sons, Jeffrey Rholetter (Debbie) and Stanley Rholetter; daughters, Linda Vinson and Sally Lowery (Mike); brother, Broadus Vinson (Ruth); sister, Sylvia Cobb (Paris); seven grandchildren, Matthew Lowery, Mitchell Lowery, Hope Rholetter, Kevin Lamar Rholetter, Julie Davis, Jennifer Haney and Kassey Cobb and eleven great-grandchildren. In addition to her parents, she is preceded in death by, Charlie Rholetter, father of her children; siblings, Mish Vinson, Cliff Vinson, Eva Bolt, Thora Long, Emma Lee, Mattie Harris, Glenn Blackwell, Ray Blackwell, Edna Hare, Ethelene McConnell, Lloyd “Bob” Vinson, and Lilly Leila Vinson. A funeral service will be held 1:00 pm, Wednesday, March 27, 2019 at Sandifer Funeral Home. The family will receive friends 6-8:00 pm, Tuesday, March 26, 2019. A burial service will be held at Holly Springs Baptist Church Cemetery. To send flowers or a remembrance gift to the family of Sophie Olivia Vinson Rholetter, please visit our Tribute Store. "Email Address" would like to share the life celebration of Sophie Olivia Vinson Rholetter. Click on the "link" to go to share a favorite memory or leave a condolence message for the family.